If you've never eaten cold vegetable pizza you need to try this recipe. It's fantastic! Not only is it much lighter than traditional pizza recipes, but it's super easy to make too. 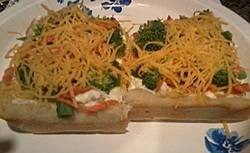 If you're thinking that I sound crazy, you may not quite know what I mean by cold veggie pizza. Many people don't, so you aren't alone. The first time I mentioned it to Aaron he was grossed out because he thought I meant raw dough. What!? Um... no. That is definitely not what this is. The dough is pre-baked and topped with cold ingredients, and let me tell you... it is absolutely delicious. The crust, which is actually made of crescent roll dough, only takes about 12 minutes to bake and you can prep your toppings while it's cooking. This is perfect for a light lunch or dinner and it even makes a great take along snack if you've got a way to keep it cold until you're ready to eat. Unroll the crescent rolls and press into a large baking dish, making sure to seal the perforated seams so the dough doesn't separate. Bake for about 10-12 minutes, until the crust is golden brown. Remove from oven and allow to cool while you prepare the toppings. In a small bowl, beat the cream cheese, sour cream (or mayonnaise) and dill until the mixture is smooth. Spread in an even layer over the crust. 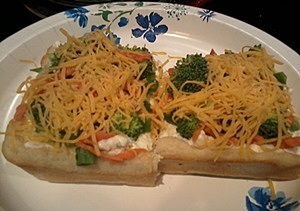 Prepare your veggies, if you haven't already, and spread them in an even layer over the cream cheese mixture. Sprinkle with olives and cheese, then press lightly to push the topping into the cream cheese mixture enough to keep the vegetables from falling off. Cover and chill for about an hour before serving. If you think you'll have some left over, cut the dough into squares and top them as you eat them. You can top enough for your meal and put the rest into a Ziplock bag for later. This will help keep the crust from getting soggy and the toppings from wilting or softening. Buy bags of mixed vegetables to cut back on prep time. I used a bag of broccoli and cauliflower and a bag of shredded carrots. Dump enough of each onto a large cutting board and coarsely chop until you have small enough pieces. If you like the taste of ranch dip better than ranch dressing, use sour cream instead of mayonnaise or miracle whip. I've used both and much prefer the taste of this pizza with sour cream.